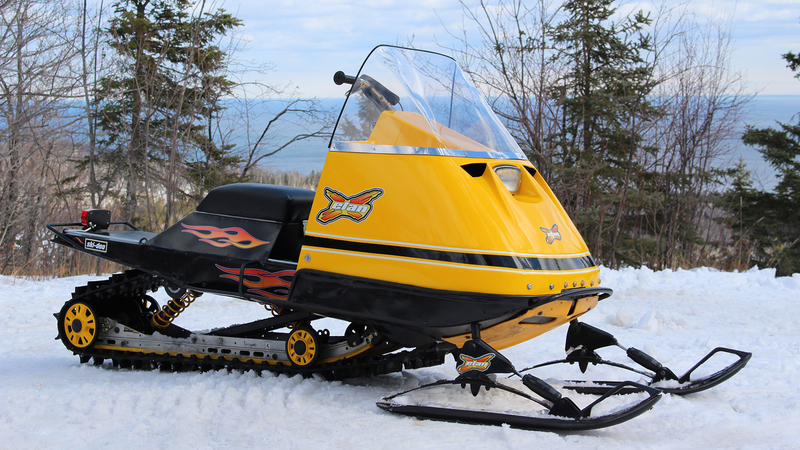 Besides repairing the sled, we wanted to make it ride, steer and go even better in deep snow than a stock Elan. 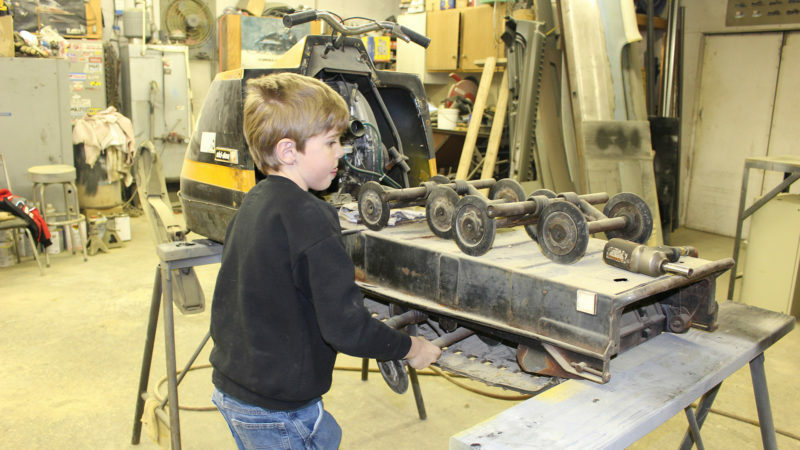 Since I was only 7 at the time I was too young to ride on the trails so we wanted to make a sled to go boon-docking through the woods. 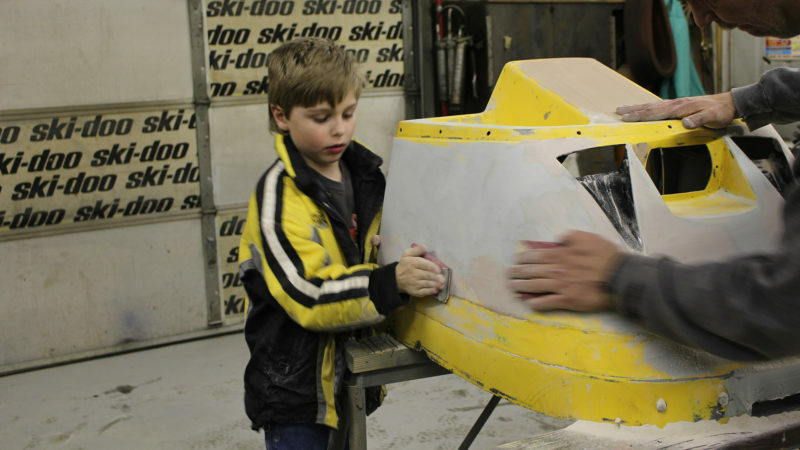 Once we painted the hood, it came out so cool and so many people commented on it that we started to bring it to vintage sled rides and shows. I started winning trophies and awards like you wouldn’t believe. I still ride it all the time. 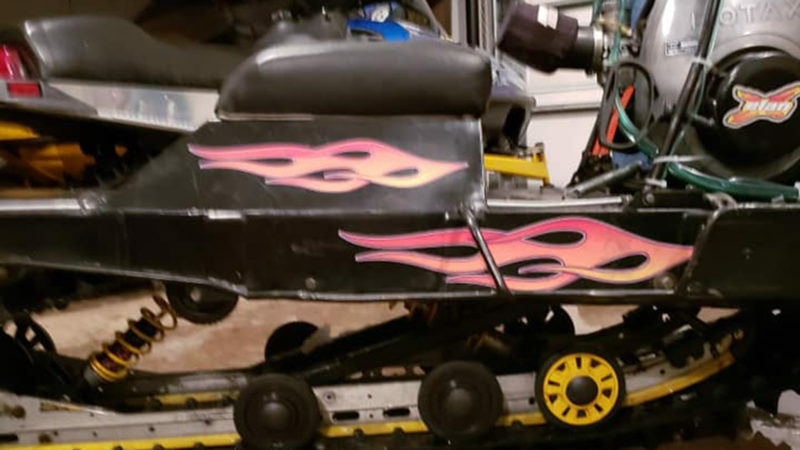 I am now 11 and it is still my favorite sled to ride. 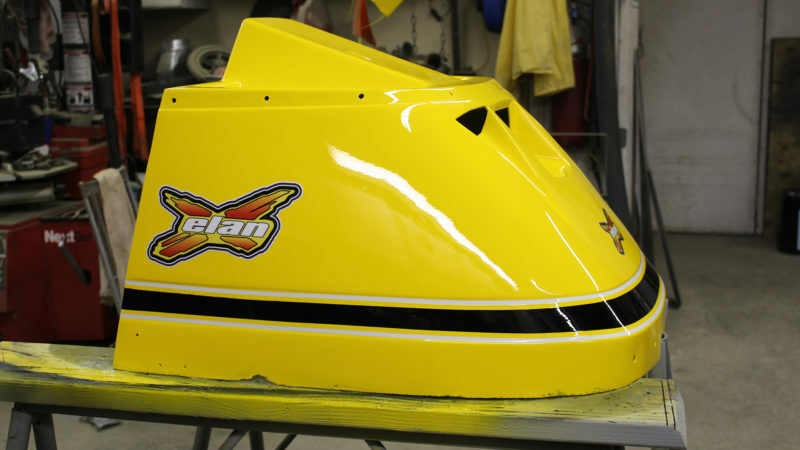 This Elan was my first sled and after the track came off I didn’t want to scrap the old machine so we made the decision to repair it and make it even better. The coolest to me was how the suspension worked because I was just 7 years old and it was all custom. How good it works in the snow. How I got to learn how to weld, bend and cut sheet metal and to paint. 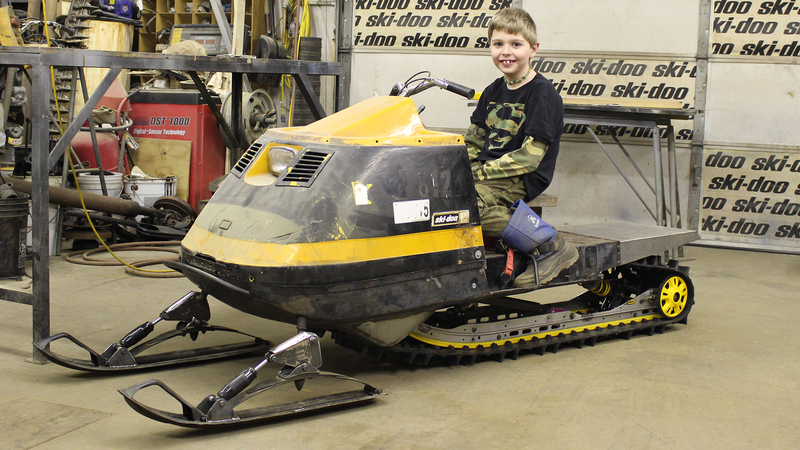 Some people say it is the coolest sled ever. But the best is when they ask if they can buy it. Cool Build Michael! Keep up the good work. 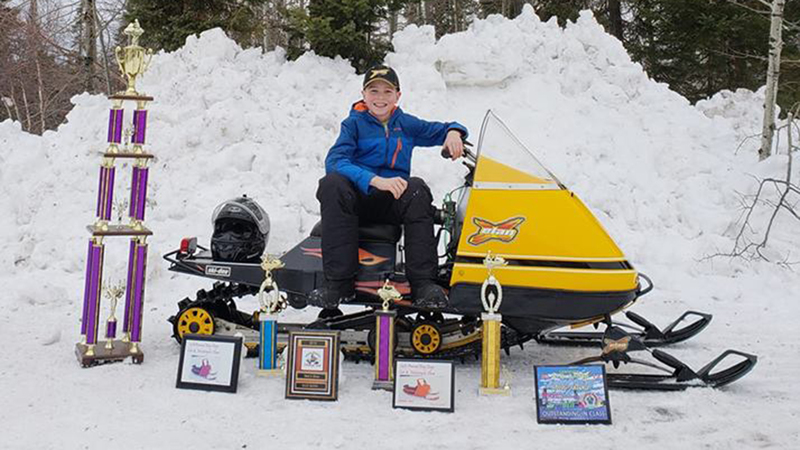 Thank you for checking out my sled it was a lot of hard work and it has all payed off. This sled is awesome!!! I have seen it in real life. Micheal is a very smart and awesome young man. His dad has taught you a lot. Keep up the great work. Can’t wait to see your next invention. This looks great Michael! Good job, very proud of you. Love this Michael! Looks like its a dream to drive and ride!!! Great job Michael! You should be proud! Engine: The original engine was a 250cc single cylinder then upgraded to a 335 single cylinder. 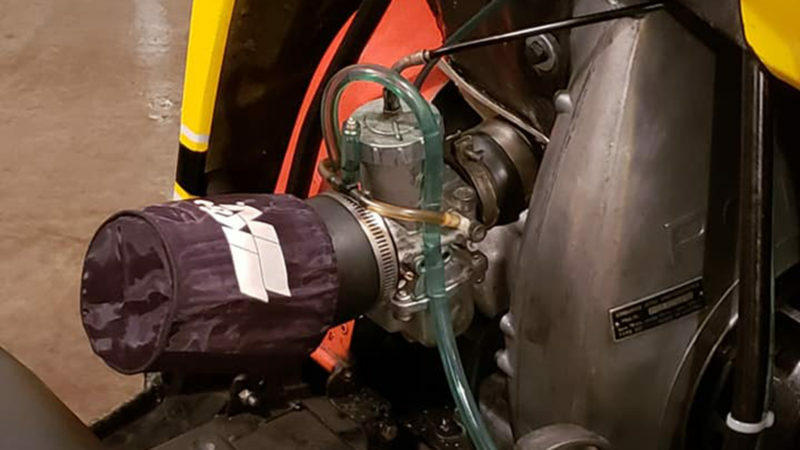 Intake: The engine is fit with a custom carburetor adapter to hold a 38mm round slide Mikuni with a K&N filter with a snow sock from Dennis Kirk. Drivetrain: The primary clutch is a 102c Comet that has been modified to fit the single cylinder crank shaft. Secondary clutch is original. The chain case uses double row chain turning a custom made drive axle with 7 tooth drivers which drives a 13 x 15 x 1.5 paddle track. 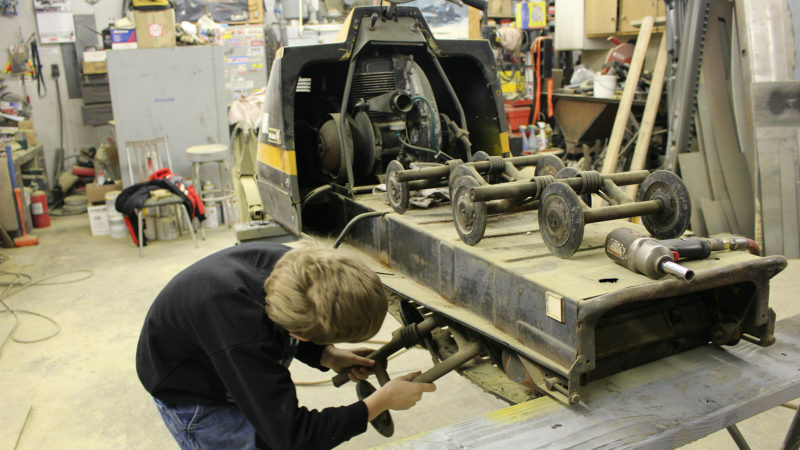 Tunnel/Chassis Modifications: Tunnel has been modified to fit a rolled back and down drive axle. The back has been cut off to get rid of rust then extended 7" beyond stock. The back of the running boards have been trimmed off and a rolled edge was welded on to strengthen the tunnel. The same rolled edge was welded on the front of the tunnel/belly pan for support. Suspension: The front suspension uses stock skies and springs with modified spindles and custom shocks, all being controlled through hand made tie rods. The rear suspension is hand make and uses single arm and 2 shocks that are calibrated for my weight. The slide rails are from a 2009 Renegade with some of the tabs cut off. Brakes: Uses factory brake at this point with hydraulic brake plans in the future. Finish - Paint: The hood was really rough, the factory vents were broken out so we installed 2 N.A.C.A. Ducts out of a 1990 Mach1 hood. Finished body work and painted all colors including stripes. We had custom Elan X graphics and flames made to put on the hood and tunnel then clear coated the graphics into the hood. We also made a custom stainless steel windshield trim for the base of the windshield. 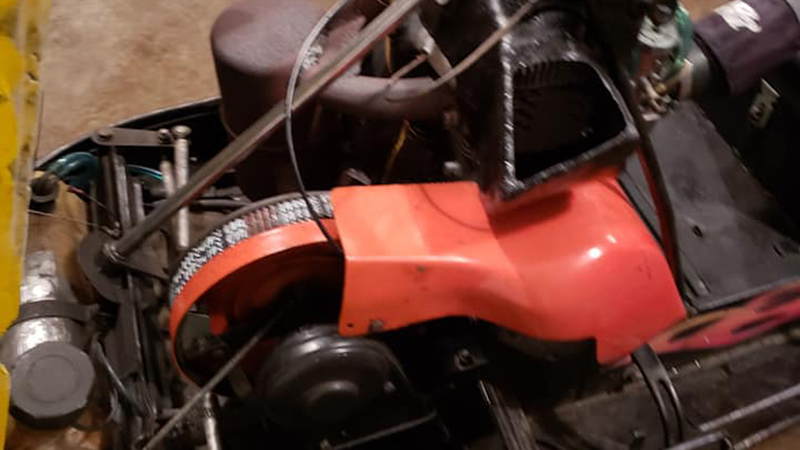 Accessories: We made a fiber glass duct that is bolted to the engine to direct hot air up behind the windshield for heat. We made a custom seat riser with padded storage and a custom seat. We also made a custom receiver hitch built into the back of the tunnel for towing things.